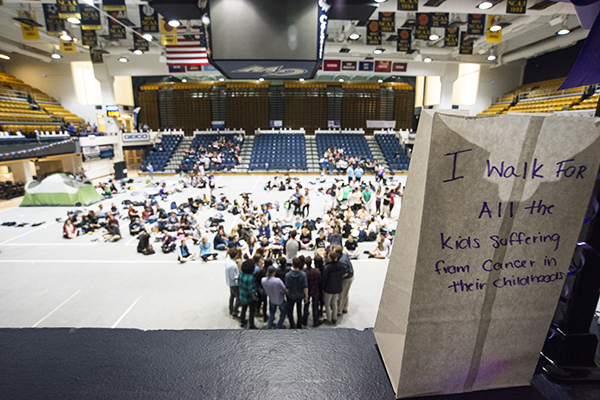 More than 60 teams camped out in the Smith Center on Friday night to honor cancer survivors and remember those who did not survive their battles. Nearly 850 students took walking or running around the makeshift track, helping to raise $38,770 for cancer research, according to the organization's website. More than 60 teams camped out in the Smith Center on Friday night to honor cancer survivors and remember those who did not survive their battles. Nearly 850 students took walking or running around the makeshift track, helping to raise $38,770 for cancer research, according to the organization’s website.